Atletico Madrid goalkeeper David de Gea has denied he has agreed to join Manchester United and insisted he will not consider his future until after June's European Under-21 Championship. On Tuesday, United manager Sir Alex Ferguson said that the club were close to landing the talented 20-year-old. De Gea's lawyer, though, has made it clear that no deal has been signed. He added: "De Gea will not consider the contract extension offer from Atletico - or any other offer - until 30 June." Speculation in both England and Spain had suggested De Gea would complete a switch to Old Trafford in the next couple of weeks. United are looking for a keeper to succeed Edwin van der Sar, who retires at the end of this season. "We've been working on it [the deal] for quite a while," said Ferguson after Gary Neville's testimonial on Tuesday. "He is young, very quick, good composure, presence and an outstanding replacement for Van der Sar." De Gea made 45 appearances for Spanish side Atletico Madrid this season, keeping an impressive 24 clean sheets to help his club finish seventh in La Liga. He has yet to win his first senior cap for Spain. Last season, he helped Atletico lift the Europa League with a 2-1 win against Fulham after extra time. Responding to the news United were close to signing De Gea, Atletico president, Enrique Cerezo, told Spanish radio station Cadena Ser: "We don't know anything. Officially neither Manchester [United] or the player at this moment have informed us of anything. "He [De Gea] knows very well that he can negotiate [with other clubs] but always that they have to pay his buy-out clause." That clause is reportedly in the region of 25m euros (£22m). 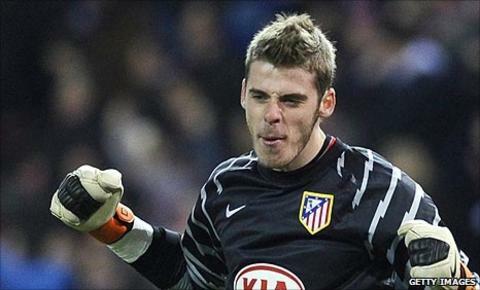 With his current deal set to expire in 2013, Atletico had hoped to convince De Gea to sign a new contract. United were reportedly keen to sign highly-rated Schalke keeper Manuel Neuer but the German international has made clear his desire to stay in his homeland. Current United number one Van der Sar will make his 265th and final appearance for the club in Saturday's Champions League final against Barcelona at Wembley. The 40-year-old former Ajax, Juventus and Fulham keeper has won six major trophies with Manchester United, including the Champions League in 2008. During the 2009/10 season, he set a Premier League record by going 1,311 minutes without conceding a goal. United also have Polish keeper Tomasz Kuszczak, Denmark international Anders Lindegaard, who they bought from Norwegian club Aalesund in November last year, and youngster Ben Amos.